Taipei, Sept. 20 (CNA) Chinese-American historian and Tang Prize laureate Yu Ying-shih reiterated Saturday his support for Taiwan's Sunflower Student Movement, but stressed the importance of demonstrating peacefully in a democratic society. "I was very touched by the Sunflower movement a while ago ... the students did not leave the Legislature until they thoroughly cleaned up the place and they left peacefully," the Princeton University emeritus professor said during a talk in Taipei on the importance of cultivating humanistic qualities in modern society. "It was a remarkable movement," the 84-year-old China-born scholar said. The Sunflower movement refers to student-led protests in March and April against the way a trade in services agreement with China was handled by the administration. The protesters occupied the parliament for 23 days and stormed the headquarters of the Cabinet, drawing mixed but mostly sympathetic reactions from the media. In a press conference a day earlier, Yu, although approving of the student's opposition, stopped short of expressing full support for the demonstrations, saying he is against "violent protests" in a democratic society. In Saturday's talk, Yu clarified that he had no intentions of "appeasing" people or asking them "not to rebel." He said citizens in a democratic society should protest and express their dissatisfaction with the government, but in a peaceful way because if all efforts fail, they can still resist the government with their ballots. Yu, an outspoken critic of the Chinese government, said Taiwan's democratization process has great significance in Chinese history because China's dynastic changes and power shifts have always been compelled by military force. Taiwan's democracy broke that cycle of violence and counters the saying that Chinese culture is opposed to the idea of democracy, freedom and equality, he said. In fact, he said, the first people who brought the idea of democracy to China were scholars influenced by Confucianism, such as Kang Youwei (1858-1927) and Yan Fu (1854-1921), proving that traditional Chinese thoughts are not against democracy. The concept of democracy also appears in a book by Chinese scholar Huang Zongxi (1610-1695), in which Huang condemned autocratic rule and proposed using schools to hold discussions on public affairs, he said. Yu is the first winner of the Tang Prize in Sinology. 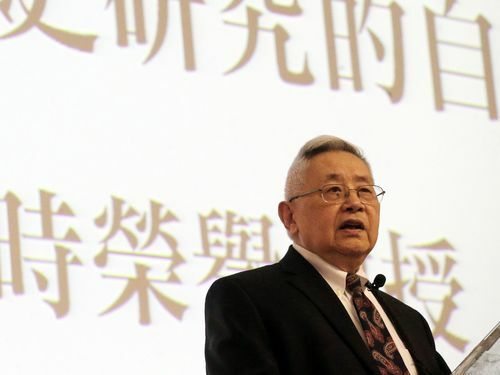 In addition to his scholarly pursuits, Yu is an outspoken supporter of the democracy movement in China and is known to have sheltered young refugees who fled China after the Tiananmen Square massacre in 1989.